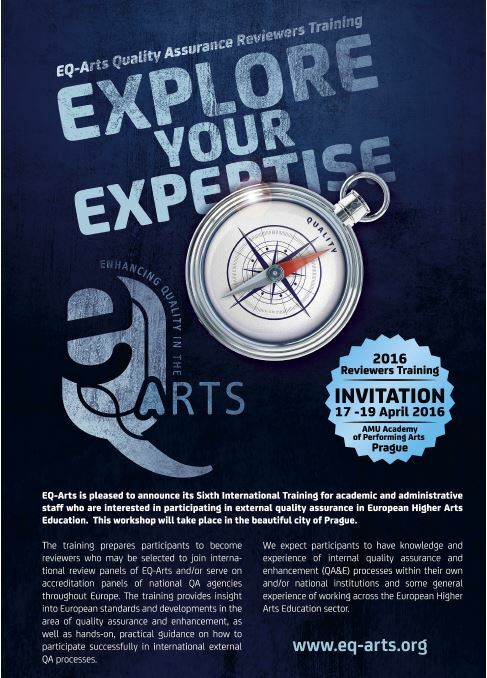 In autumn 2015, the quality assurance activities of the European League of Institutes of the Arts (ELIA) were transferred to EQ-Arts, a community of trained and experienced professionals in higher arts education who have developed and tested quality assurance methodologies of arts by conducting institutional and subject reviews across Europe. EQ-Arts is an independent foundation, initiated by ELIA through the European Commission’s Thematic Network programme. EQ-Arts will organise an international quality assurance and enhancement training workshop for academic and administrative staff who are interested in undertaking reviewer or rapporteur roles in European higher arts education quality assurance processes. The training (the details of which are contained in the flyer below) will take place on 17-19 April 2016 in Prague. It will prepare participants to become reviewers who may be selected to join international review panels of EQ-Arts and/or serve on the accreditation panels of national QA agencies. Those wishing to participate in this workshop are kindly requested to send a statement of interest to s.mometti@eq-arts.org outlining their current institutional role(s) and responsibilities and motivation and experience of quality assurance processes and activities (a maximum of 500 words). EQ-Arts reserves the right to accept and reject proposals subject to appropriate experiences and availability of places. The deadline for registration is 1 February 2016. Applications are particularly welcome from those teaching in architecture, design (graphic, fashion, product, etc. ), design crafts, film/media, performing arts (dance, theatre, etc. ).